Asserting that a Ram temple will be built in Ayodhya soon, Uttar Pradesh Chief Minister Yogi Adityanath said on Sunday a piece of good news regarding this awaited devotees all over the country. He said a South Korean delegation was coming to Ayodhya to celebrate Diwali on Nov 6 when the festival of lights would be celebrated at Lord Ram's birthplace on a grand scale. 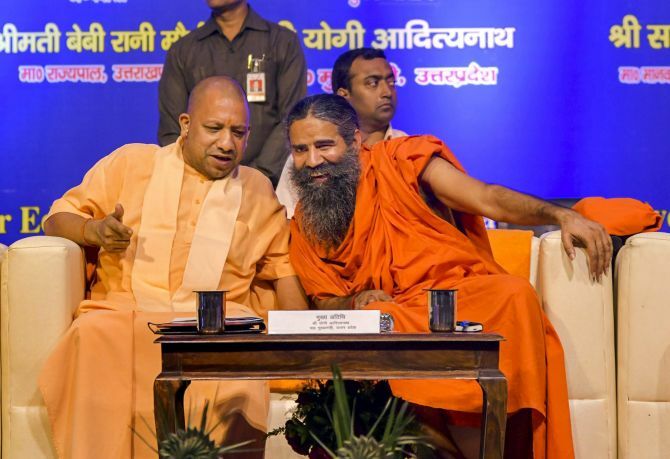 Speaking at the concluding ceremony of Gyankumbh, a two-day meet at Patanjali Yogpeeth here on improvements of the higher education standards, Adityanath said the Lord Ram's devotees all over the country will not have to wait for long for a piece of good news on the construction of a grand temple in Ayodhya. He also appealed to everyone to light a lamp this Diwali in the name of Lord Ram. On improvement of the higher education standards in the country, the UP CM said the use of unfair means at examinations must be stopped and teachers should be made accountable for it. Noting that these measures will lead to major changes, he said it has been done in Uttar Pradesh. Yoga guru Ramdev said Yogi Adityanath was the country's future and the BJP MPs should bring a legislation in Parliament to build a Ram temple in Ayodhya. "Parliament is the highest institution in a democracy," Ramdev said. Technical sessions of Gyankumbh were out of bounds for the media and the suggestions made by academicians and educationists at the event will be forwarded to the Union Ministry for Human Resources. Union minister Uma Bharti said on Sunday that while Hindus were the 'most tolerant' people in the world, any talk of constructing a mosque on the periphery of a Ram temple in Ayodhya could make them 'intolerant'. The minister also invited Congress chief Rahul Gandhi to lay the foundation stone of the temple in Ayodhya with her, saying he would 'atone for the sins' of his party by doing so. "Hindus are the most tolerant community in the world. I will appeal to all politicians: please don't make Hindus intolerant by talking about building a mosque on the outer periphery of the birthplace of Lord Ram in Ayodhya," Bharti told PTI in an interview. She said when there could not be a temple in the holy town of Medina or a mosque in the Vatican City, it would be 'unfair' to talk about a mosque in Ayodhya. Describing the Ayodhya dispute as one of land and not faith, the firebrand Hindu leader said, "This is now only a matter of dispute of land, not dispute of faith. It has been resolved that Ayodhya is the birth place of Lord Ram." She also stressed the need for an out-of-court settlement of the contentious issue, and urged all political leaders -- including Gandhi, Samajwadi Party president Akhilesh Yadav, Bahujan Samaj Party leader Mayawati and Trinamool Congress chief Mamata Banerjee -- to support this. "We need support of all political parties on this issue. I invite all leaders including, Rahul Gandhiji, come let's lay the foundation stone of the Ram temple with me," Bharti said. By doing so, the Gandhi-scion could atone for the past sins of the Congress, which always created 'hurdles' in building the temple in Ayodhya, she said. SP supremo Mulayam Singh, Banerjee, Mayawati and the Left parties should support the BJP on this issue as it is of national interest, she said. "But they aren't letting the matter get resolved. The Congress will have to quit the habit of dividing the country in the name of religion," Bharti said, reiterating that all political parties should unite on this issue. Bharti, who had participated in the Ram Janmabhoomi movement of the 1990s, said she was fully committed to the construction of Ram temple. "If they tell me that Ram Mandir will be built only over my dead body, then so be it," she said. Uttar Pradesh deputy chief minister Keshav Prasad Maurya said in Lakhimpur Kheri on Sunday that no power can stop construction of grand Ram temple at Ayodhya. He said, the Bharatiya Janata Party 'was, is and will always' favour construction of the Ram temple in Ayodhya. "The issue is pending with the Supreme Court, hence, I cannot comment," he said. Maurya, however, hastened to add,"We can tell for certain in one line that a grand Ram temple would be constructed whenever time comes." He was responding to queries about congregation of religious seers in Delhi to press for Ram temple construction through an ordinance by the Union government. Maurya said he respected the sentiments of honourable seers regarding the temple. He along with party organisation secretary Sunil Bansal was here to attend an event. The deputy chief minister reiterated his party's stand on the issue and said, "No power can stop construction of grand Ram temple at the birthplace of Ramlala." "As on date, the matter is pending with the Supreme Court and its verdict is awaited," he said, adding, "What we can firmly assure (people) is that not even a brick in the name of Babar would be laid or allowed to be laid at the birthplace of Ramlala". Taking a jibe at the Congress president without naming him, Maurya said "The people are realising the 'asaliyat' and 'nakaliyat' (what is genuine and what is fake) of those who are attempting to cheat the Hindu community by putting on 'janeu' (sacred thread)." "The Congress must explain as to why it intended hearing (of Ayodhya issue) in 2019," he added. Congress leader Shashi Tharoor has said no Hindu text condones the use of violence to get one's way and scriptures say people should build Ram in their hearts. "In fact, if anything, there is a scripture that says build Ram in your heart. And if Ram is built in our heart it should little matter where else he is or he is not, because he is everywhere," Tharoor said in an exclusive interview to PTI. "My only point is, would a Hindu have wanted to build such a precious place at the expense of conducting an act of violence. A good Hindu is a law-abiding Hindu. A good Hindu is someone who has 'insaaniyat'," the Congress leader asked. He went on to argue that while a good Hindu was also obviously somebody who worshipped and believed in his worship, Hindu scriptures do not allow the use of violence to have one's way. "A good Hindu is also obviously somebody who worships and believes in his worship. But where have we been told in our Hindu texts and our Hindu teachings which, in fact since the days of Adi Shankaracharya, have emphasised much more on ahimsa. Where have we been told that we should conduct violence against other people to have our way," questioned Tharoor. The Lok Sabha MP from Thiruvananthapuram also wondered what about his remarks had 'shocked the BJP so much'. He said, "Most good Hindus I know would want a Ram Temple at the place where they believe he was born. But most good Hindus would not have wanted it by demolishing other people's place of worship. And this is more or less what Atal Bihari Vajpayee and LK Advani also said." The Congress leader quoted Advani as having called the day of demolition of Babri Masjid as the 'saddest day of his life'. "Advani said he would have respectfully wanted to relocate the site and Vajpayee had also hinted at all sorts of compromises provided the Ram Temple could also be built, it could even be a joint wall between a mosque and a temple. "Who knows what Vajpayee would have wanted? He is not here to tell us but no, neither of them ever spoke in terms of demolishing the mosque and when it happened they both condemned it. So what am I saying that is so shocking for the BJP?" asked Tharoor. "A temple really did exist. Whether it was the Ram Temple we don't know. Definitely there were pillars underneath. But given the experiences of that period so many temples were destroyed and mosques built in their places. I am not challenging the historical veracity of this belief, that debate is over. That's totally academic now," said the Congress MP. The Congress leader acknowledged that 'the important thing is that an overwhelming majority of Hindus particularly in north India believe this was where Lord Ram was born and where there should be a mandir', but went on to add, 'to my mind arguing that point is academic'. To a pointed query on whether he personally wanted a Ram Temple at the stated site, Tharoor said, "I have said as much as I wanted to say."